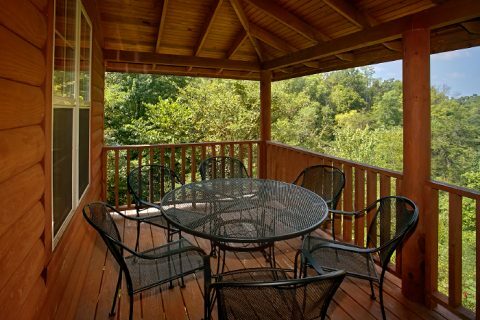 Experience peace, privacy, and seclusion in the Great Smoky Mountains of Tennessee when you stay at "2 Tranquil 4 Words!" 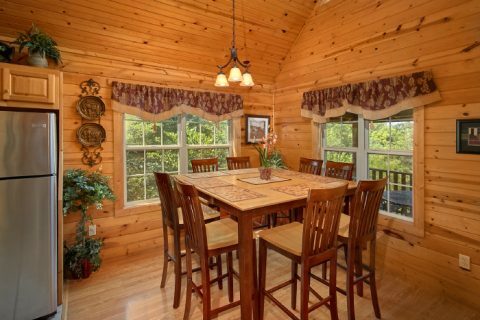 This 2-bedroom cabin in the Smokies provides guests with 4 private acres to enjoy in the mountains near Pigeon Forge. 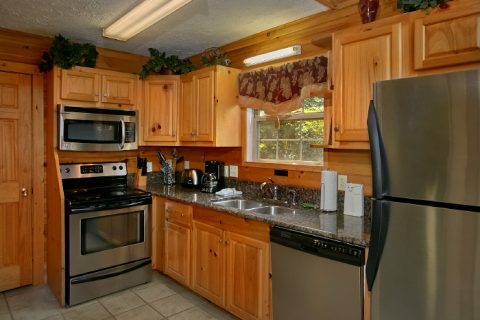 At the same time, guests can enjoy quick access to the Smoky Mountains National Park, Dollywood, Pigeon Forge, and Gatlinburg! 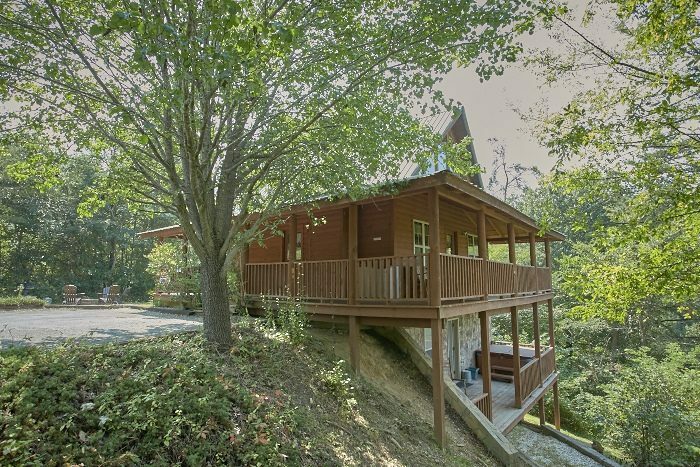 After all, this private cabin is only 7 miles from the heart of Downtown Pigeon Forge. 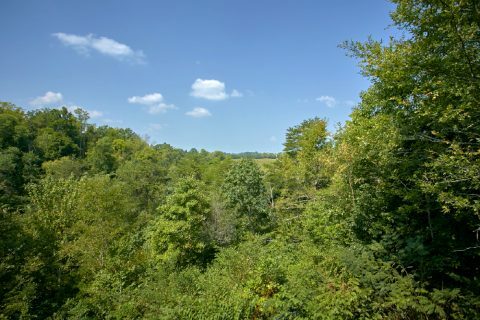 By reaching the Pigeon Forge Parkway, the Smokies' biggest destinations are within easy reach. 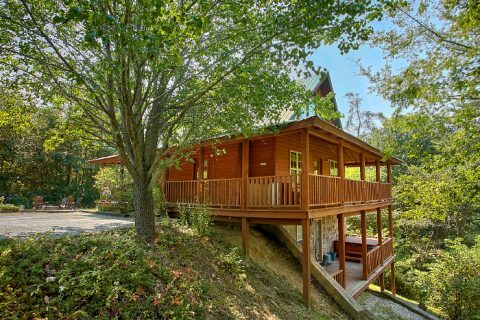 After you've had a great day exploring top local attractions, you'll love returning to your comfortable cabin nestled in a forested property with mountain views. Better yet, you'll have plenty of ways to relax. Kick back on comfortable leather furniture by the gas fireplace in the living room. 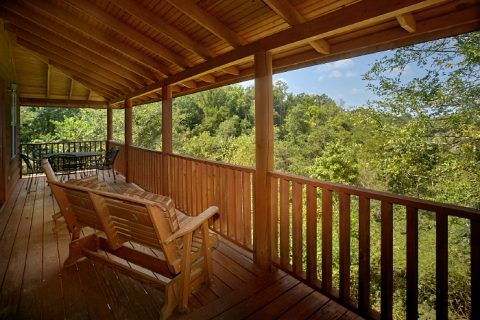 Sit outside on the deck and take in your cabin's mountain view. 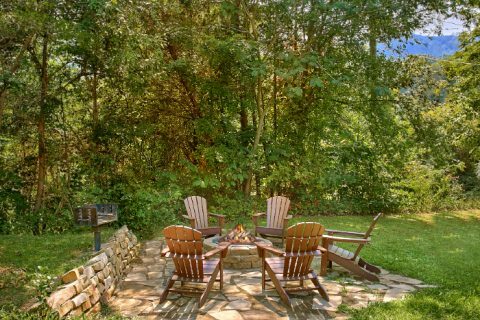 Cozy up to the outdoor fire pit on the stone patio in the yard. 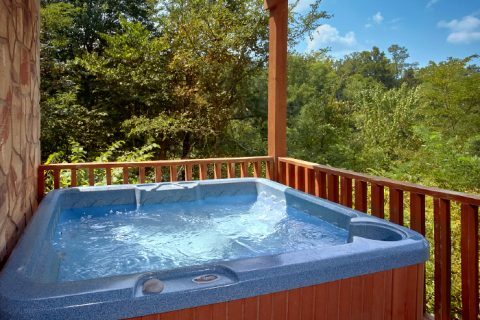 Sink into the hot tub on the lower deck and feel your cares melt away with the steamy water. 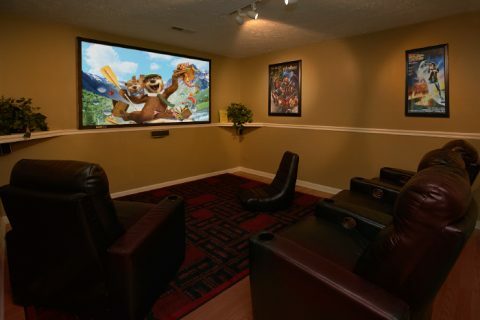 For great in-cabin entertainment, this rental offers a theater room with an 8-foot screen, surround sound, and theater seats for watching your favorite movies and shows. 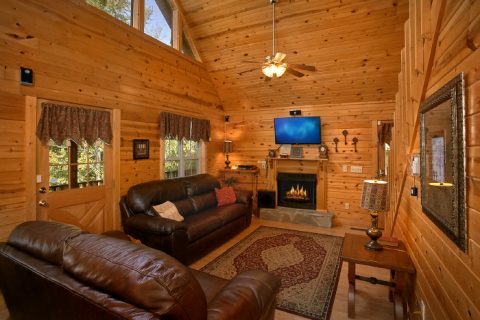 Upstairs, there's also a 42" LED HD TV in the living area that comes complete with a DVD player and surround sound. 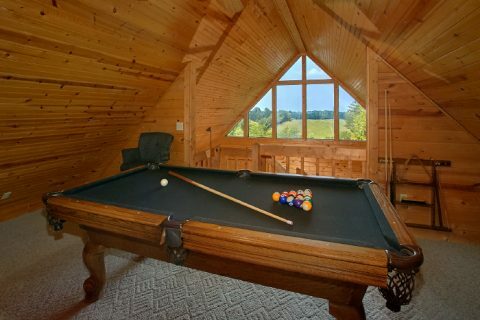 This rental offers two game areas: one is the pool table in the upstairs loft and the other is a sitting are downstairs with an arcade game and dart board. 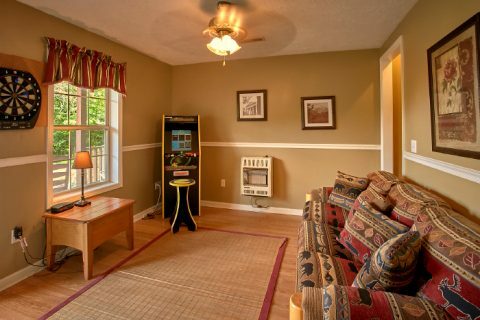 In addition to these fun and relaxing amenities, you'll find plenty of practical features too. The full kitchen area with a dining table for 8 guests allows you the convenience to make great meals at home. WiFi Internet Access and a washer/dryer are other features that keep your vacation exactly the way it should be: simple. 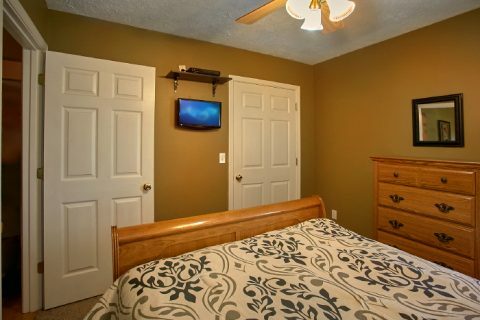 For getting a good night's rest, this rental offers two bedrooms. The main level bedroom provides a king-size log frame bed, a private television, and access to a full bath that it shares with the living area. The leather sofa sleeper provides extra space for guests in the lower level and the upstairs loft provides 2 comfortable futons. 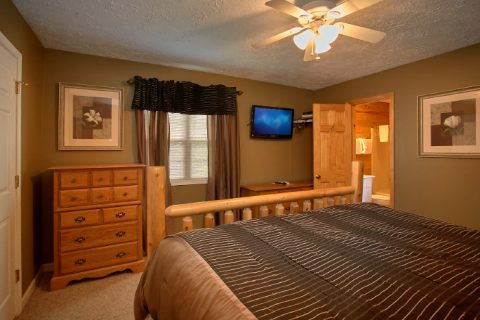 The downstairs bedroom comes with a queen bed, television, and access to a bath that is shared with the lower level. Altogether, this cabin easily sleeps up to 10 guests in comfort. 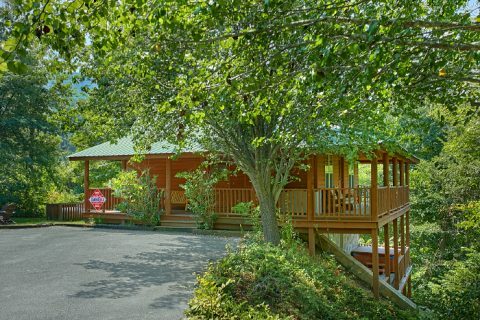 Book "2 Tranquil 4 Words" online today with Cabins USA Gatlinburg to save 15% on the nightly rate for your Smoky Mountain cabin vacation!